Ebola virus (EBOV) causes highly lethal hemorrhagic fever that leads to death in up to 90% of infected humans. Like many other infections, EBOV induces massive lymphocyte apoptosis, which is thought to prevent the development of a functional adaptive immune response. In a lethal mouse model of EBOV infection, we show that there is an increase in expression of the activation/maturation marker CD44 in CD4+ and CD8+ T cells late in infection, preceding a dramatic rebound of lymphocyte numbers in the blood. Furthermore, we observed both lymphoblasts and apoptotic lymphocytes in spleen late in infection, suggesting that there is lymphocyte activation despite substantial bystander apoptosis. To test whether these activated lymphocytes were functional, we performed adoptive transfer studies. Whole splenocytes from moribund day 7 EBOV-infected animals protected naive animals from EBOV, but not Marburgvirus, challenge. In addition, we observed EBOV-specific CD8+ T cell IFN-γ responses in moribund day 7 EBOV-infected mice, and adoptive transfer of CD8+ T cells alone from day 7 mice could confer protection to EBOV-challenged naive mice. Furthermore, CD8+ cells from day 7, but not day 0, mice proliferated after transfer to infected recipients. Therefore, despite significant lymphocyte apoptosis, a functional and specific, albeit insufficient, adaptive immune response is made in lethal EBOV infection and is protective upon transfer to naive infected recipients. These findings should cause a change in the current view of the ‘impaired’ immune response to EBOV challenge and may help spark new therapeutic strategies to control lethal filovirus disease. Lymphocyte apoptosis is a common finding in severe viral infections, including SARS (1, 2), influenza (3, 4), Crimean-Congo Hemorrhagic Fever (5), and Hantavirus (6). It is often hypothesized that induction of lymphocyte apoptosis by viral infection obstructs the development of an effective adaptive immune response, leading to overwhelming infection and death. Ebola virus (EBOV)3 is a single-stranded, negative sense RNA virus that causes severe, and often lethal, hemorrhagic disease (reviewed in Ref. 7). A key feature of the disease is severe bystander lymphocyte apoptosis, which is seen in both mouse (8, 9, 10) and nonhuman primate models (11, 12) and is suggested in humans (13, 14, 15). Since lymphocytes are not productively infected by EBOV, it has been suggested that lymphocyte apoptosis may be induced by NO, FasL, TRAIL, or immunosuppressive sequences in the viral proteins (12, 16, 17). In addition, there are in vitro data suggesting that EBOV infection dysregulates dendritic cell functions, inducing altered cytokine expression and decreased T cell stimulatory activity (18, 19, 20). Such diminished dendritic cell function is thought to abrogate functional adaptive immune responses. Monocytes, in contrast, are activated upon infection and secrete proinflammatory cytokines (16, 21, 22). A model has emerged in which early infection of dendritic cells causes abnormal innate immune responses, allowing the virus to evade the first wave of immunoregulation. In this model, the aberrant innate immune response leads to compromised adaptive immune responses, which are further abrogated by massive bystander lymphocyte apoptosis (12). However, the activation status of lymphocyte subsets during the course of EBOV infection have not been functionally studied; for example, the question of whether lymphocytes undergo apoptosis after partial activation, which could occur in the presence of incompletely activated dendritic cells, remains unanswered. To address these issues, a lethal mouse model of EBOV virus infection, in which death occurs on or around day 7 postinfection, was used. Lymphocyte responses to EBOV in mice are similar to those seen in nonhuman primates and humans, including classical lymphocyte apoptosis (9, 10). Serial sampling experiments were performed, spleen and blood were harvested daily after infection, and lymphocytes were analyzed for activation markers. There was an increase in the percentage of CD4+ and CD8+ T cells expressing high levels of CD44, an activation and maturation marker, toward the end of lethal EBOV infection. 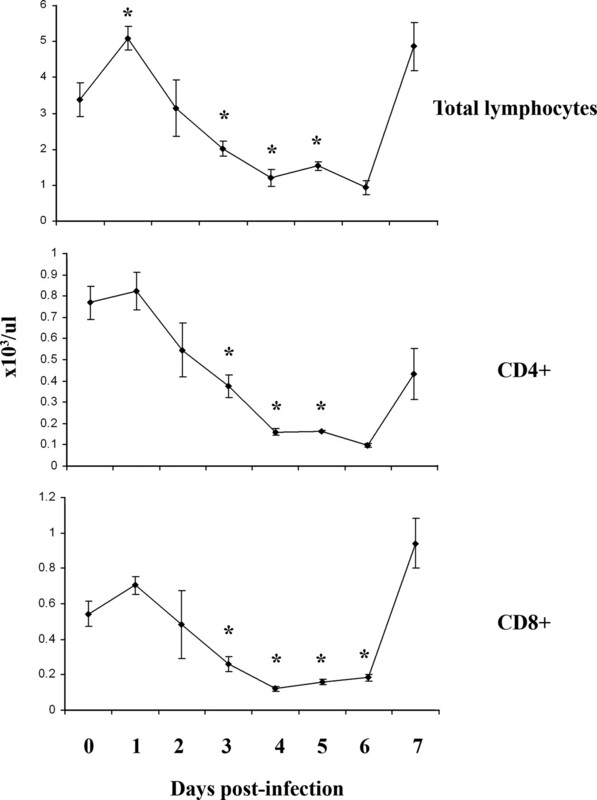 Increased expression of CD44 correlated with increased lymphocyte numbers in the blood and previously reported lymphoblast presence in the spleen (9), which are indicative of lymphocyte activation and proliferation. These data led to a hypothesis that a functional lymphocyte response was being generated in lethal EBOV infection. Importantly, transfer of splenocytes from day 7 mice protected naive mice from EBOV, but not Marburgvirus (MARV), challenge. Furthermore, EBOV-specific IFN-γ production in CD8+ T cells was observed in day 7 mice, and transfer of day 7 CD8+ cells protected recipients from EBOV challenge. Together, the data supports the hypothesis that functional adaptive immune responses are present in lethal EBOV-infected mice despite massive lymphocyte apoptosis, suggesting that augmentation of this ongoing response may result in protection against EBOV infection. C57BL/6 mice, 6–10 wk old, were obtained from the National Cancer Institute, Frederick Cancer Research and Development Center. Congenic CD45 mice were purchased from The Jackson Laboratory. Infections were performed with 1000 PFU of mouse-adapted EBOV-Zaire, MARV-Ravn, or MARV-Ci67 via i.p. injection (8) (K. L. Warfield, S. B. Bradfute, J. Wells, L. Lofts, M. T. Cooper, D. A. Alves, D. K. Reed, S. A. VanTongeren, C. A. Mech, and S. Bavari, unpublished data). MARV adaptation was done by serially passaging wild-type virus in SCID mice to obtain a rapidly lethal SCID-adapted virus (23). The SCID-adapted MARV was then serially passaged via liver homogenates in immunocompentent BALB/c mice until lethal in BALB/c mice; the lethal mouse-adapted MARV isolates were purified by plaque selection (K. L. Warfield, S. B. Bradfute, J. Wells, L. Lofts, M. T. Cooper, D. A. Alves, D. K. Reed, S. A. VanTongeren, C. A. Mech, and S. Bavari, manuscript in preparation). The disease course of the mouse-adapted MARV is similar to that seen in guinea pigs and nonhuman primate models, including uncontrolled viremia (>106 PFU/ml), extremely high viral titers in the liver, spleen, lymph node, and other organs, profound lymphocytopenia and destruction of lymphocytes within the spleen and lymph nodes, and marked liver damage (K. L. Warfield, S. B. Bradfute, J. Wells, L. Lofts, M. T. Cooper, D. A. Alves, D. K. Reed, S. A. VanTongeren, C. A. Mech, and S. Bavari, manuscript in preparation). For serial sampling, five mice were euthanized each day after 1000 PFU i.p. challenge with mouse-adapted EBOV-Zaire (days 0–7); the experiment was repeated and data were pooled. For the study of immune responses in late-stage infected mice, moribund mice were defined as very sick mice that would be euthanized at day 7 ± 1 postinfection according to our protocol; these mice are referred to as “day 7.” Euthanasia was done by CO2 asphyxiation. Research performed at US Army Medical Research Institute of Infectious Diseases was conducted in compliance with the Animal Welfare Act and other federal statutes and regulations relating to animals and experiments involving animals and adheres to principles stated in the Guide for the Care and Use of Laboratory Animals (National Research Council, 1996). US Army Medical Research Institute of Infectious Diseases is fully accredited by the Association for the Assessment and Accreditation of Laboratory Animal Care International. All EBOV-infected cells and mice were handled under maximum containment in a biosafety level-4 laboratory at the US Army Medical Research Institute of Infectious Diseases. Cardiac puncture was used to acquire blood from anesthetized mice into EDTA tubes. For lymphocyte number, blood was analyzed with a Beckman Coulter ACT 10 counter. Remaining blood was lysed with RBC lysing buffer (Sigma-Aldrich) and washed with RPMI 1640 medium containing 2% FCS. Spleens were harvested and RBCs were lysed. For both blood and splenocytes, Abs (purchased from eBioscience and BD Biosciences) were added at 1:100, incubated for 15 min at 4°C, and then washed. Clones used were GK1.5 (CD4), IM7 (CD44), and 53-6.7 (CD8a). Cells were analyzed with a FACSCanto II (BD Biosciences). Blood CD4+ and CD8+ cell numbers were determined by multiplying the percentage of any particular subset residing in the lymphoid gate by the total lymphocyte number for that animal. Splenocytes from uninfected or day 7 (harvested at day 6–8, depending on the development of severe disease) mice were harvested, and RBCs were lysed as above. In experiments using enriched populations, splenocytes (either untreated or after processing with Histopaque 1083 (Sigma- Aldrich)) were stained with a CD8b biotinylated Ab (clone CT-CD8b, eBioscience), and cells were enriched according to the manufacturer’s protocol using streptavidin magnetic beads (BD Biosciences). Purity was checked by flow cytometry. Cells were resuspended in PBS, counted, and injected i.p. into naive recipient mice ∼15 min after EBOV or MARV infection. In transfer of whole splenocytes or purified CD8+ cells, donor cells were thoroughly washed during the isolation process, ensuring that neither Abs nor cytokines were transferred to recipient mice. For donor tracking experiments, whole splenocytes from day 0 or 7 CD45.2 mice were labeled with CFSE (Invitrogen Life Technologies) according to the manufacturer’s protocol. Ten million labeled splenocytes were transferred, as stated above, into congenic recipients (CD45.1), and 2 days later, spleens were removed, stained, and analyzed by flow for CD45.1 (clone A20; BD Biosciences), CD45.2 (clone 104, BD Biosciences), CD8, and CFSE expression. This experiment was repeated using CD45.1 mice as donors and CD45.2 mice as recipients with similar results. Splenocytes from uninfected or day 7 mice were incubated with 0.2 μg/ml of either an irrelevant MARV peptide (gp 1–15) or a pool of 10 EBOV peptides, known to be CD8+ epitopes in mice after EBOV vaccination (24) and were the gift of J. Dye and G. Gene Olinger of the US Army Medical Research Institute of Infectious Diseases. The EBOV peptides used were IPVYQVNNLEEICQL, NAGQFLSFASLFLPK, PFDAVLYYHMMKDEP, WIPYFGPAAEGIYTE, FSKSQLSLLCETHLR, DRQSLIMFITAFLNI, SDIFCDIENNPGLCY, AEMVAKYDLLVMTTG, AKPLRNIMYDHLPGF, and RIGNQAFLQEFVLPP. The MARV peptide used was MRTTCLFISLILIQGI. After 30–60 min at 37°C, brefeldin A was added and cells were incubated for 4–5 h before staining with the indicated cell surface Abs. Cells were then washed, fixed, and permeabilized using the BD cytofix/cytoperm kit according to the manufacturer’s instructions, stained for intracellular IFN-γ (clone XMG1.2; BD Biosciences), and analyzed on a FACSCanto II. Blood lymphocyte numbers are severely depleted in EBOV infection in BALB/c mice (9, 25), nonhuman primates (11, 12), and likely in humans (15). As expected, this was observed in infected C57BL/6 mice (Fig. 1⇓). A rebound in total blood lymphocyte number was detected at day 7 postinfection. This lymphocyte “spike” was more prominent in CD8+ than CD4+ cell numbers. Interestingly, a similar phenomenon in T cells has been reported in late-stage lethal infection of nonhuman primates (12, 26). Lymphocyte numbers in blood during the course of EBOV infection in mice. C57BL/6 mice were infected with 1000 PFU of mouse-adapted EBOV, and blood and spleen were harvested daily and analyzed. Lymphocyte numbers in the blood diminish during the course of EBOV infection but rebound shortly before death. CD4+ and CD8+ cell numbers show the same trend, although the recovery is more prominent in CD8+ cells. Two separate experiments were conducted and combined, n = 5–10. ∗, p < 0.05 relative to day 0. To determine the activation status of CD4+ and CD8+ T cells during this disease, the expression of the activation marker CD44 over the course of EBOV infection was monitored. CD44 is expressed on all lymphocytes and is up-regulated upon activation. The percentage of blood CD4+ or CD8+ cells that expressed high levels of CD44 (CD44high) increased on days 5, 6, and 7 post-EBOV infection (Fig. 2⇓A). The total number of CD8+CD44high cells in blood decreased on days 3–5 but recovered and increased on day 7 (Table I⇓). The total number of CD4+CD44high cells in blood also decreased early in infection but recovered on day 7 (Table I⇓). Similarly, in spleen there was an increase in the percentage of CD8+ and CD4+ cells that were CD44high on days 6 and 7 postinfection, even though there was a significant decrease in this population early in infection (Fig. 2⇓B). Furthermore, the total number of CD4+CD44high and CD8+CD44high cells per spleen also increased late in infection (Fig. 2⇓C), suggesting an expansion of these subsets. Numbers of total CD8+ or CD4+ cells per gram of spleen show a decrease in these subsets during infection but an increase in CD8+CD44high cells per gram (Table I⇓). Increased T cell activation in lethal EBOV infection in mice. To determine whether T cells are activated during infection, mice were infected with EBOV and T cell populations were analyzed for the activation marker CD44 daily following infection. A, Percentage of CD8+ and CD4+ cells in the blood that are CD44high increases toward the end of infection. B, Percentage of CD4+ or CD8+ splenocytes that are CD44high increase late in infection. C, Absolute number of CD4+CD44high and CD8+CD44high cells per spleen. Both populations increase late in infection. D, Representative histogram showing dramatically increased CD44 expression and reduced CD62L and CD127 expression in day 7 CD4+ or CD8+ splenocytes compared with day 0, indicative of activated cells late in EBOV infection. ∗, p < 0.05 relative to day 0. Data shown are from two separate experiments, n = 5–10. To ascertain whether these cells express activation markers other than CD44, cells were stained with the CD62L and CD127. As shown in Fig. 2⇑D, CD4+ and CD8+ splenocytes express decreased levels of CD62L and CD127 and increased levels of CD44 late in infection, confirming the phenotype of activated cells. Together, these data suggest that there is activation in CD4+ and CD8+ cells in the late stages of EBOV infection. Mouse-adapted EBOV infection of C57BL/6 mice results in death 7–10 days postchallenge. H&E sections of spleens from day 7 infected mice showed severe lymphocyte death (evidenced by nuclear condensation and fragmentation) compared with control uninfected mice (Fig. 3⇓). TUNEL staining was also increased, indicating an increase in lymphocyte apoptosis (Fig. 3⇓). However, there were also lymphoblasts (enlarged lymphocytes with oval nuclei and scant cytoplasm) concurrently present in day 7 spleens (Fig. 3⇓), suggestive of an ongoing immune response. Although this has been reported in BALB/c mice (9) and nonhuman primates (12), there has been no explanation as to why blast cells are present. Lymphoblasts and lymphocyte death in day 7 EBOV-infected mice. Representative H&E and TUNEL-stained spleens from uninfected (day 0) or day 7 EBOV-infected C57BL/6 mice are shown. Compact and fragmented nuclei, indicative of apoptosis, are present in day 7, but not day 0, spleens (arrowheads). Lymphoblasts are also present in day 7 spleens (arrows). TUNEL staining reveals substantial apoptosis at day 7, but not in uninfected, mice. Scale bar is 200 μm. It is intriguing to note that the rebound in blood lymphocyte number occurs directly after increased CD44 expression and concurrently with the appearance of lymphoblasts, and these data suggest an adaptive immune response may be taking place in lethal EBOV infection. To explore this possibility, whole splenocytes from day 7 EBOV-infected mice were adoptively transferred to naive mice shortly (∼15 min) after EBOV infection. Surprisingly, adoptive transfer of only 1 million splenocytes rescued 90% of the recipient mice, although weight loss in these mice was significant before showing recovery (Fig. 4⇓, A and B). Transfer of 10 million or 20 million splenocytes from day 7 mice prevented death in the recipient infected mice (Fig. 4⇓A). Furthermore, mice receiving 10 or 20 million splenocytes from day 7 mice did not show significant weight loss, suggesting that there was not severe disease in the treated mice (Fig. 4⇓B). As a control, transfer of 1, 10, or 20 million splenocytes from uninfected animals did not provide protection to infected recipients (Fig. 4⇓, A and B). Transfer of splenocytes from day 7, but not uninfected, mice protects naive mice from EBOV infection. To determine whether activated lymphocytes from day 7 EBOV-infected mice are functional, adoptive transfer experiments were performed. A and B, Twenty, 10, or 1 million splenocytes from uninfected or day 7 moribund mice were injected into naive EBOV-infected mice. Survival curves (A) and weights (B) of each group demonstrate that as few as 1 million splenocytes from moribund day 7 EBOV-infected mice can rescue recipients from EBOV challenge. C and D, Ten million splenocytes from day 1-, 3-, or 5-infected mice were injected into naive EBOV-infected recipients. Survival curves (C) and weights (D) for each group. Splenocytes from day 5 EBOV-infected mice confer greater protection to recipients than day 3 mice, correlating with the development of an acquired response, n = 10 per group. 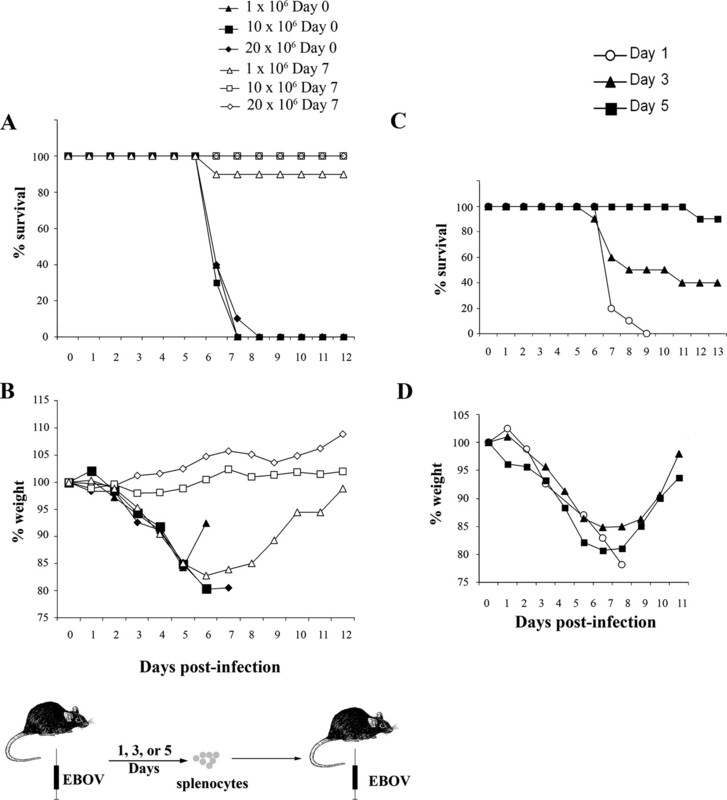 To determine the kinetics of the development of a protective transferable response in lethally infected animals, splenocytes were harvested from mice 1, 3, or 5 days postinfection and transferred to naive, EBOV-infected recipients (Fig. 4⇑, C and D). Mice receiving 10 million day 1 splenocytes did not survive, whereas there was moderate protection in mice receiving day 3 splenocytes. Day 5 splenocytes conferred complete protection, although the mice became very sick before recovering, based on weight loss. In comparison, 10 million splenocytes from day 7 mice conferred complete protection, and the mice did not lose weight (Fig. 4⇑A). Therefore, the efficacy of protection increases with time postinfection, suggesting the protection is due to the development of an adaptive immune response. Although animals vaccinated against EBOV do not show protection to challenge with the related MARV (27, 28), it is possible that the protection seen in transfer of splenocytes from day 7 animals is due to non-specific cellular activation and subsequent secretion of inflammatory cytokines. MARV is the only member of the filoviridae other than EBOV, and recently a novel mouse model for MARV has been developed (K. L. Warfield, S. B. Bradfute, J. Wells, L. Lofts, M. T. Cooper, D. A. Alves, D. K. Reed, S. A. VanTongeren, C. A. Mech, and S. Bavari, manuscript in preparation). To test specificity of the immune response in day 7 EBOV-infected mice, BALB/c mice were infected with EBOV virus. Splenocytes from day 7 EBOV-infected animals were harvested and injected into naive recipient mice, which were then infected with EBOV, MARV-Ravn, or MARV-Ci67. Recipients infected with EBOV were protected, as observed before; however, recipients infected with either MARV strain were not protected (Fig. 5⇓). 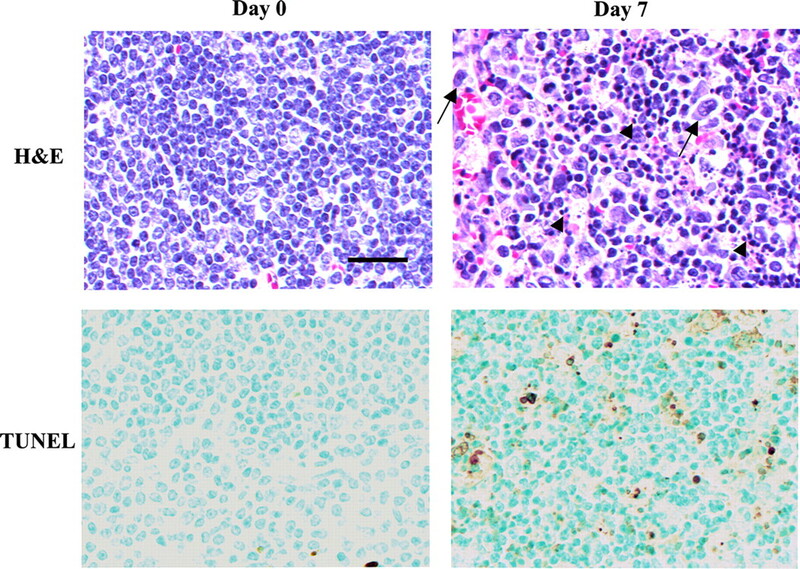 These data demonstrate that transferred splenocytes from day 7 EBOV-infected animals are specifically protective to EBOV and not MARV-infected animals, suggestive of an adaptive immune response. 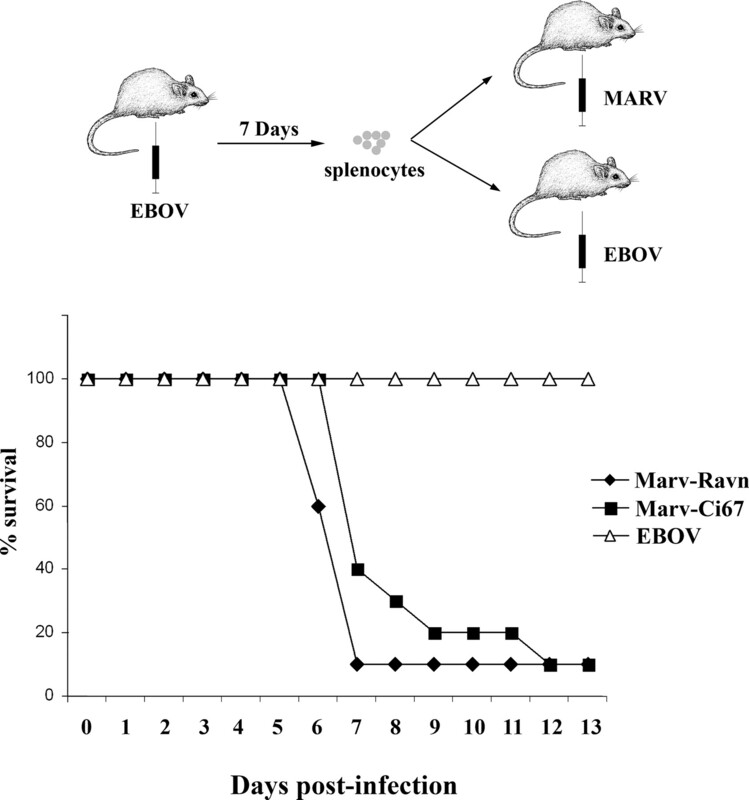 Transfer of splenocytes from EBOV-infected mice does not protect against MARV challenge. Ten million splenocytes from day 7 EBOV-infected BALB/c mice were injected into naive EBOV-, MARV-Ravn-, or MARV-Ci67-infected mice. EBOV-infected recipients were protected but MARV-infected mice were not, suggesting specificity of the immune response, n = 10 per group. To determine whether there is a functional CD8+ T cell response in day 7 EBOV-infected mice, CD8+ cells were purified from uninfected or day 7 mice and adoptively transferred into naive mice, which were then infected with EBOV. As shown in Fig. 6⇓A, transfer of 1.8 million highly purified (>95%) CD8+ cells from day 7 EBOV-infected, but not uninfected, mice protected naive mice from challenge. Functional CD8+ T cell EBOV-specific responses are present in day 7 mice. A, A total of 1.8 million CD8+ cells from day 0 or EBOV-infected day 7 C57BL/6 mice were purified (96% purity) and injected into EBOV-infected naive recipients. CD8+ T cells alone were sufficient to transfer protection, n = 10. B, Splenocytes from day 7 EBOV or uninfected mice were cultured with no peptide, irrelevant MARV peptide, or a mixture of 10 EBOV peptides known to be CD8+ epitopes in vaccination. Increased IFN-γ staining was observed in CD8+ T cells from day 7, but not day 0, EBOV-peptide-stimulated splenocytes. Graphs show gated CD3+CD8+ cells. C, Graphs show combined from 2 to 4 separate experiments, demonstrating that EBOV-specific CD8+ T cell responses were made during lethal EBOV infection. D, day 7, but not day 0, CD8+ cells proliferate after transfer to infected naive recipients, as evidenced by reduced CFSE fluorescence. Plots shown are gated on CD45.2+ (donor) CD8+ cells 2 days after transfer. Data shown are representative of two separate experiments. ∗, p < 0.05 relative to day 0 controls; ∗∗, p < 0.05 relative to day 7 controls. To determine whether CD8+ T cells in day 7 mice are EBOV-specific, intracellular cytokine assays were performed. Splenocytes from uninfected or day 7 EBOV-infected mice were isolated and stimulated with either no peptide, an irrelevant MARV gp peptide, or a pool of 10 EBOV peptides known to be CD8+ T cell epitopes in vaccinated mice (24). As shown in Fig. 6⇑, B and C, CD8+ T cells from day 7 EBOV-infected, but not uninfected, mice produced increased amounts of IFN-γ after incubation with the EBOV peptide pool. Splenocytes from day 7 EBOV-infected mice stimulated with an irrelevant MARV peptide produced statistically significant levels of IFN-γ relative to day 0 splenocytes, presumably due to ongoing in vivo activation before stimulation. However, there was no difference in IFN-γ production between no-peptide- and MARV-peptide-stimulated day 7 splenocytes (Fig. 6⇑C), confirming the lack of stimulation with the MARV peptide. In any event, addition of the EBOV peptide pool significantly increased IFN-γ production in day 7, but not uninfected, splenocytes. To analyze the fate of the CD8+ cells after transfer, cell tracking experiments were performed using the CD45 congenic system. CD45 is expressed on all nucleated cells of hemopoietic origin. White blood cells from congenic mice expressing different alleles of CD45 can be identified via differential Ab staining, making this system ideal for tracking the fate of transferred donor cells. Donor whole splenocytes from day 0 or 7 EBOV-infected mice were labeled with CFSE and transferred into CD45 congenic naive EBOV-infected recipients. Two days later, recipient splenocytes were stained with both donor and recipient CD45-specific Abs, and donor cells were analyzed for CD8 and CFSE. Donor CD8+ cells from day 7, but not day 0, mice proliferated after adoptive transfer, as shown by reduced CFSE expression 2 days posttransfer (Fig. 6⇑D). The proliferation was even more pronounced on days 4 and 5 posttransfer (data not shown). 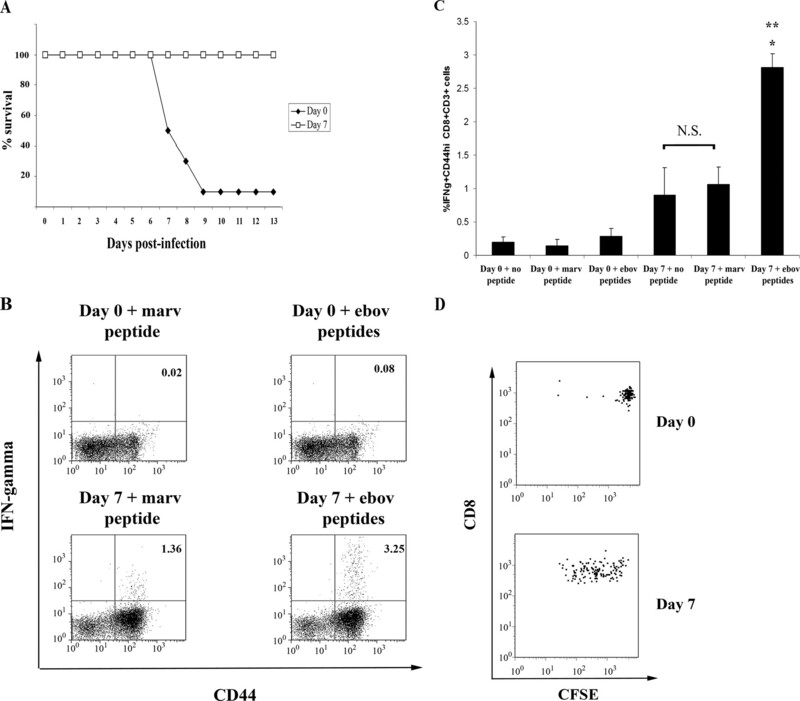 Together, this data suggest that there is a functional and specific CD8+ T cell response in day 7 EBOV-infected animals, despite the presence of massive classical lymphocyte apoptosis. The data presented here show that there is an EBOV-specific adaptive CD8+ T cell immune response late in lethal EBOV infection. This correlates with increased CD44high expression (Fig. 2⇑), recovery of lymphocytes in blood (Fig. 1⇑), and the presence of lymphoblasts in spleen (Fig. 3⇑) (9). Transfer of whole splenocytes from day 7 EBOV-infected mice protects recipients from lethal EBOV, but not MARV, challenge (Figs. 4⇑ and 5⇑). This protection is best developed late in infection (Fig. 4⇑, C and D). In addition, there are EBOV-specific CD8+ T cell responses in day 7 animals, and adoptive transfer of CD8+ cells is sufficient for protection (Fig. 6⇑). There are several possible explanations as to why this immune response is insufficient for survival in this model. First, the response may be too late to control the rapidly replicating virus, which can reach serum titers of up to 108 PFU/ml (9). Although the development of the CD8+ response described here is similar to what would be expected from a successful immune response, the speed at which disease occurs may outpace the response. Similarly, the number of CD8+ T cells that are generated could be too low to control high viral titers but are sufficient upon transfer to newly infected animals to control the disease. Secondly, the immune response could be dampened by altered cytokine production in the day 7 animals and are more functional or effective after transfer to a newly infected animal. Third, the damage done by infection could be too severe to overcome at the time the adaptive immune system responds. A relevant question is whether these findings are congruent with the nonhuman primate models and humans. Lymphocyte responses to EBOV in the mouse and nonhuman primate models seem to be quite similar. Lymphocyte apoptosis is seen in the mouse and nonhuman primate models ((10, 12); Fig. 3⇑) as well as in human cases (13, 14, 15). There are analogous blood lymphocyte spikes late in EBOV infection in nonhuman primates (12, 26). Furthermore, lymphoblasts are found in the spleen of late-stage lethally infected nonhuman primates (29) and mice (9). More importantly, there is a report of lymphoblasts and plasmacytoid lymphocytes in the acute stage of EBOV-infected humans, suggestive of a lymphocyte response (30). Together, this suggests that there is likely an adaptive immune response in fatal nonhuman primate and human EBOV infection. The data presented here show that functional, EBOV-specific CD8+ T cell responses exist late in lethal infection. Since EBOV-induced lymphocyte apoptosis does not abrogate functional CD8+ T cell responses, the question remains as to how and why EBOV infection induces lymphocyte apoptosis and whether this is a key contributor to pathogenesis. In lethal mouse models of influenza and rabies infection, elimination of FasL results in decreased T cell apoptosis and subsequent increased animal survival (31, 32). In contrast, elimination of the proapoptotic gene Bim increases virus-specific CD8+ T cell survival in chronic lymphocytic choriomeningitis virus (LCMV) infection but has only a moderate impact on viral titers (33). Bystander lymphocyte apoptosis occurs early in a successful immune response against acute LCMV infection (34, 35). Clearly, the CD8+ T cells that respond to EBOV described here have avoided elimination by apoptosis. Therefore, the question of whether blocking apoptosis would improve the overall immune response in EBOV infection is at least partially dependent on whether the apoptotic lymphocytes are specific for EBOV. In acute LCMV infection, there is evidence for apoptosis in both LCMV-specific and non-LCMV-specific CD8+ T cells (34, 35, 36); however, it is currently unknown whether apoptotic lymphocytes in EBOV infection are EBOV-specific. Together, these data suggest that the role of lymphocyte apoptosis in viral infections differs and must be determined on a case-by-case basis. Furthermore, this report highlights the importance of searching for the presence of adaptive immune responses in other lethal infections. The magnitude of the EBOV-specific CD8+ T cell response in lethal infection is not known at this time, although there is a significant response that provides protection upon adoptive transfer (Fig. 6⇑A). The peptides used in Fig. 6⇑, B and C, contain known CD8+ T cell epitopes induced by vaccination (24). However, a thorough characterization of epitopes that are relevant in EBOV infection in naive mice has not been done at this point; this discovery would shed light on the magnitude of the CD8 T cell response in lethal EBOV infection. In mouse respiratory syncytial virus infection, there is a strong expansion of Ag-specific CD8+ T cells in the lung, but only a fraction of these cells are functional (as determined by cytokine production or cytotoxic ability) (37). Whether this is the case in EBOV infection will be resolved as more immunologic tools become available in the EBOV system. The presence of a functional adaptive immune response suggests that at least some innate immune cells escape viral subversion and subsequently present Ag to CD8+ T cells. In vitro data clearly show functional impairment of dendritic cells, monocytes, and NK cells after exposure to EBOV (16, 19, 20, 21, 22, 38, 39, 40). However, there must be some level of functional Ag presentation and stimulation of lymphocytes to generate the CD8+ T cells response reported here. There have been no reports of in vivo dendritic cell or macrophage function during EBOV infection. The data presented here also do not preclude the possibility that functional B cell responses may also be present in day 7 animals. Together these findings suggest that a relevant, transferable adaptive immune response occurs late in lethal EBOV infection, despite the presence of massive classical lymphocyte apoptosis. We hypothesize that this response occurs too late to contain the infection, resulting in lethality. These findings raise the intriguing possibility that therapeutics may only need to slow the progression of the EBOV infection to allow the developing adaptive immune response time to respond to the virus. Indeed, antiviral therapeutics targeting viral genes based on antisense phosphorodiamidate morpholino oligomers or short interfering RNA can greatly improve survival of EBOV-infected, treated animals (41, 42), presumably by allowing the host extra time to respond to the viral infection by slowing down viral replication (41). Furthermore, therapeutic vaccine treatment in EBOV- or MARV-infected non-human primates directly after infection provides partial and complete protection, respectively, in an Ag-specific manner (43, 44). Although no mechanism has been proven for this effect, the data reported here suggests that it is possible that the treatment accelerates or augments the functional, but insufficient, adaptive immune response that is formed in infected animals. In a different strategy, treating nonhuman primates with an inhibitor of coagulation resulted in diminished coagulopathy, viral titers, and inflammatory cytokines, rescued 1/3 of animals from EBOV infection, and delayed time-to-death of the rest of the treated animals (45). Therefore it is possible that this treatment gave the ongoing immune response time to develop. However, these theories remain to be examined more thoroughly. In addition, whether or not blocking lymphocyte apoptosis or improving dendritic cell function during infection can increase the effectiveness of this adaptive response remains to be determined. The finding of a functional, but insufficient, adaptive immune response in lethal filoviral infection represents a significant shift from the current view of the immune response to EBOV challenge. These findings should spark new research in the development of immunotherapeutics, as the data suggest that the adaptive response in lethal EBOV infection is significant and may be protective with treatments that enhance the quality and magnitude of the ongoing immune responses. S. B. Bradfute is a National Research Council Research Associate. We thank S. VanTongeren and D. Reed for outstanding technical assistance and W. Kalina for helpful advice concerning the experiments and review of the manuscript. We also thank G. Olinger and J. Dye for providing peptides and G. Ruthel for help with microscopy and manuscript review and mouse illustrations. ↵1 This work was partly supported by the Defense Threat Reduction Agency. Opinions, interpretations, conclusions, and recommendations are those of the authors and are not necessarily endorsed by the U.S. Army. ↵3 Abbreviations used in this paper: EBOV, Ebola virus; MARV, Marburgvirus; LCMV, lymphocytic choriomeningitis virus. Ding, Y., H. Wang, H. Shen, Z. Li, J. Geng, H. Han, J. Cai, X. Li, W. Kang, D. Weng, et al 2003. The clinical pathology of severe acute respiratory syndrome (SARS): a report from China. J. Pathol. 200: 282-289. Wong, R. S., A. Wu, K. F. To, N. Lee, C. W. Lam, C. K. Wong, P. K. Chan, M. H. Ng, L. M. Yu, D. S. Hui, et al 2003. Haematological manifestations in patients with severe acute respiratory syndrome: retrospective analysis. BMJ 326: 1358-1362. To, K. F., P. K. Chan, K. F. Chan, W. K. Lee, W. Y. Lam, K. F. Wong, N. L. Tang, D. N. Tsang, R. Y. Sung, T. A. Buckley, et al 2001. Pathology of fatal human infection associated with avian influenza A H5N1 virus. J. Med. Virol. 63: 242-246. Tumpey, T. M., X. Lu, T. Morken, S. R. Zaki, J. M. Katz. 2000. Depletion of lymphocytes and diminished cytokine production in mice infected with a highly virulent influenza A (H5N1) virus isolated from humans. J. Virol. 74: 6105-6116. Baskerville, A., A. Satti, F. A. Murphy, D. I. Simpson. 1981. Congo-Crimean haemorrhagic fever in Dubai: histopathological studies. J. Clin. Pathol. 34: 871-874. Wahl-Jensen, V., J. Chapman, L. Asher, R. Fisher, M. Zimmerman, T. Larsen, J. W. Hooper. 2007. Temporal analysis of Andes virus and Sin Nombre virus infections of Syrian hamsters. J. Virol. 81: 7449-7462. Hoenen, T., A. Groseth, D. Falzarano, H. Feldmann. 2006. Ebola virus: unravelling pathogenesis to combat a deadly disease. Trends Mol. Med. 12: 206-215. Bray, M., K. Davis, T. Geisbert, C. Schmaljohn, J. Huggins. 1998. A mouse model for evaluation of prophylaxis and therapy of Ebola hemorrhagic fever. J. Infect. Dis. 178: 651-661. Gibb, T. R., M. Bray, T. W. Geisbert, K. E. Steele, W. M. Kell, K. J. Davis, N. K. Jaax. 2001. Pathogenesis of experimental Ebola Zaire virus infection in BALB/c mice. J. Comp. Pathol. 125: 233-242. Bradfute, S. B., D. R. Braun, J. D. Shamblin, J. B. Geisbert, J. Paragas, A. Garrison, L. E. Hensley, T. W. Geisbert. 2007. Lymphocyte death in a mouse model of Ebola virus infection. J. Infect. Dis. 196: (Suppl. 2):S296-S304. Geisbert, T. W., L. E. Hensley, T. R. Gibb, K. E. Steele, N. K. Jaax, P. B. Jahrling. 2000. Apoptosis induced in vitro and in vivo during infection by Ebola and Marburg viruses. Lab. Invest. 80: 171-186. Geisbert, T. W., L. E. Hensley, T. Larsen, H. A. Young, D. S. Reed, J. B. Geisbert, D. P. Scott, E. Kagan, P. B. Jahrling, K. J. Davis. 2003. Pathogenesis of Ebola hemorrhagic fever in cynomolgus macaques: evidence that dendritic cells are early and sustained targets of infection. Am. J. Pathol. 163: 2347-2370. No authors listed. 1978. Ebola haemorrhagic fever in Sudan, 1976: report of a WHO/International Study Team. Bull. W. H. O. 56: 247-270. No authors listed. 1978. Ebola haemorrhagic fever in Zaire, 1976. Bull. W. H. O. 56: 271-293. Baize, S., E. M. Leroy, M. C. Georges-Courbot, M. Capron, J. Lansoud-Soukate, P. Debre, S. P. Fisher-Hoch, J. B. McCormick, A. J. Georges. 1999. Defective humoral responses and extensive intravascular apoptosis are associated with fatal outcome in Ebola virus-infected patients. Nat. Med. 5: 423-426. Hensley, L. E., H. A. Young, P. B. Jahrling, T. W. Geisbert. 2002. Proinflammatory response during Ebola virus infection of primate models: possible involvement of the tumor necrosis factor receptor superfamily. Immunol. Lett. 80: 169-179. Yaddanapudi, K., G. Palacios, J. S. Towner, I. Chen, C. A. Sariol, S. T. Nichol, W. I. Lipkin. 2006. Implication of a retrovirus-like glycoprotein peptide in the immunopathogenesis of Ebola and Marburg viruses. FASEB J. 20: 2519-2530. Bosio, C. M., M. J. Aman, C. Grogan, R. Hogan, G. Ruthel, D. Negley, M. Mohamadzadeh, S. Bavari, A. Schmaljohn. 2003. Ebola and Marburg viruses replicate in monocyte-derived dendritic cells without inducing the production of cytokines and full maturation. J. Infect. Dis. 188: 1630-1638. Mahanty, S., K. Hutchinson, S. Agarwal, M. McRae, P. E. Rollin, B. Pulendran. 2003. Cutting edge: impairment of dendritic cells and adaptive immunity by Ebola and Lassa viruses. J. Immunol. 170: 2797-2801. Bosio, C. M., B. D. Moore, K. L. Warfield, G. Ruthel, M. Mohamadzadeh, M. J. Aman, S. Bavari. 2004. Ebola and Marburg virus-like particles activate human myeloid dendritic cells. Virology 326: 280-287. Gupta, M., S. Mahanty, R. Ahmed, P. E. Rollin. 2001. Monocyte-derived human macrophages and peripheral blood mononuclear cells infected with Ebola virus secrete MIP-1α and TNF-α and inhibit poly-IC-induced IFN-α in vitro. Virology 284: 20-25. Stroher, U., E. West, H. Bugany, H. D. Klenk, H. J. Schnittler, H. Feldmann. 2001. Infection and activation of monocytes by Marburg and Ebola viruses. J. Virol. 75: 11025-11033. Olinger, G. G., M. A. Bailey, J. M. Dye, R. Bakken, A. Kuehne, J. Kondig, J. Wilson, R. J. Hogan, M. K. Hart. 2005. Protective cytotoxic T-cell responses induced by venezuelan equine encephalitis virus replicons expressing Ebola virus proteins. J. Virol. 79: 14189-14196. Bray, M., S. Hatfill, L. Hensley, J. W. Huggins. 2001. Haematological, biochemical and coagulation changes in mice, guinea-pigs and monkeys infected with a mouse-adapted variant of Ebola Zaire virus. J. Comp. Pathol. 125: 243-253. Reed, D. S., L. E. Hensley, J. B. Geisbert, P. B. Jahrling, T. W. Geisbert. 2004. Depletion of peripheral blood T lymphocytes and NK cells during the course of ebola hemorrhagic Fever in cynomolgus macaques. Viral Immunol. 17: 390-400. Jones, S. M., H. Feldmann, U. Stroher, J. B. Geisbert, L. Fernando, A. Grolla, H. D. Klenk, N. J. Sullivan, V. E. Volchkov, E. A. Fritz, et al 2005. Live attenuated recombinant vaccine protects nonhuman primates against Ebola and Marburg viruses. Nat. Med. 11: 786-790. Warfield, K. L., D. L. Swenson, D. L. Negley, A. L. Schmaljohn, M. J. Aman, S. Bavari. 2004. Marburg virus-like particles protect guinea pigs from lethal Marburg virus infection. Vaccine 22: 3495-3502. Geisbert, T. W., H. A. Young, P. B. Jahrling, K. J. Davis, T. Larsen, E. Kagan, L. E. Hensley. 2003. Pathogenesis of Ebola hemorrhagic fever in primate models: evidence that hemorrhage is not a direct effect of virus-induced cytolysis of endothelial cells. Am. J. Pathol. 163: 2371-2382. Sanchez, A., M. Lukwiya, D. Bausch, S. Mahanty, A. J. Sanchez, K. D. Wagoner, P. E. Rollin. 2004. Analysis of human peripheral blood samples from fatal and nonfatal cases of Ebola (Sudan) hemorrhagic fever: cellular responses, virus load, and nitric oxide levels. J. Virol. 78: 10370-10377. Legge, K. L., T. J. Braciale. 2005. Lymph node dendritic cells control CD8+ T cell responses through regulated FasL expression. Immunity 23: 649-659. Baloul, L., S. Camelo, M. Lafon. 2004. Up-regulation of Fas ligand (FasL) in the central nervous system: a mechanism of immune evasion by rabies virus. J. Neurovirol. 10: 372-382. Grayson, J. M., A. E. Weant, B. C. Holbrook, D. Hildeman. 2006. Role of Bim in regulating CD8+ T-cell responses during chronic viral infection. J. Virol. 80: 8627-8638. McNally, J. M., C. C. Zarozinski, M. Y. Lin, M. A. Brehm, H. D. Chen, R. M. Welsh. 2001. Attrition of bystander CD8 T cells during virus-induced T-cell and interferon responses. J. Virol. 75: 5965-5976. Bahl, K., S. K. Kim, C. Calcagno, D. Ghersi, R. Puzone, F. Celada, L. K. Selin, R. M. Welsh. 2006. IFN-induced attrition of CD8 T cells in the presence or absence of cognate antigen during the early stages of viral infections. J. Immunol. 176: 4284-4295. Chang, J., T. J. Braciale. 2002. Respiratory syncytial virus infection suppresses lung CD8+ T-cell effector activity and peripheral CD8+ T-cell memory in the respiratory tract. Nat. Med. 8: 54-60. Gibb, T. R., D. A. Norwood, Jr, N. Woollen, E. A. Henchal. 2002. Viral replication and host gene expression in alveolar macrophages infected with Ebola virus (Zaire strain). Clin. Diagn. Lab. Immunol. 9: 19-27. Fuller, C. L., G. Ruthel, K. L. Warfield, D. L. Swenson, C. M. Bosio, M. J. Aman, S. Bavari. 2007. NKp30-dependent cytolysis of filovirus-infected human dendritic cells. Cell. Microbiol. 9: 962-976. Warfield, K. L., J. G. Perkins, D. L. Swenson, E. M. Deal, C. M. Bosio, M. J. Aman, W. M. Yokoyama, H. A. Young, S. Bavari. 2004. Role of natural killer cells in innate protection against lethal Ebola virus infection. J. Exp. Med. 200: 169-179. Marty, A. M., P. B. Jahrling, T. W. Geisbert. 2006. Viral hemorrhagic fevers. Clin. Lab. Med. 26: 345-386, viii. Daddario-DiCaprio, K. M., T. W. Geisbert, U. Stroher, J. B. Geisbert, A. Grolla, E. A. Fritz, L. Fernando, E. Kagan, P. B. Jahrling, L. E. Hensley, et al 2006. Postexposure protection against Marburg haemorrhagic fever with recombinant vesicular stomatitis virus vectors in non-human primates: an efficacy assessment. Lancet 367: 1399-1404. Geisbert, T. W., L. E. Hensley, P. B. Jahrling, T. Larsen, J. B. Geisbert, J. Paragas, H. A. Young, T. M. Fredeking, W. E. Rote, G. P. Vlasuk. 2003. Treatment of Ebola virus infection with a recombinant inhibitor of factor VIIa/tissue factor: a study in rhesus monkeys. Lancet 362: 1953-1958.